Love Coffee Liqueur and Cream? 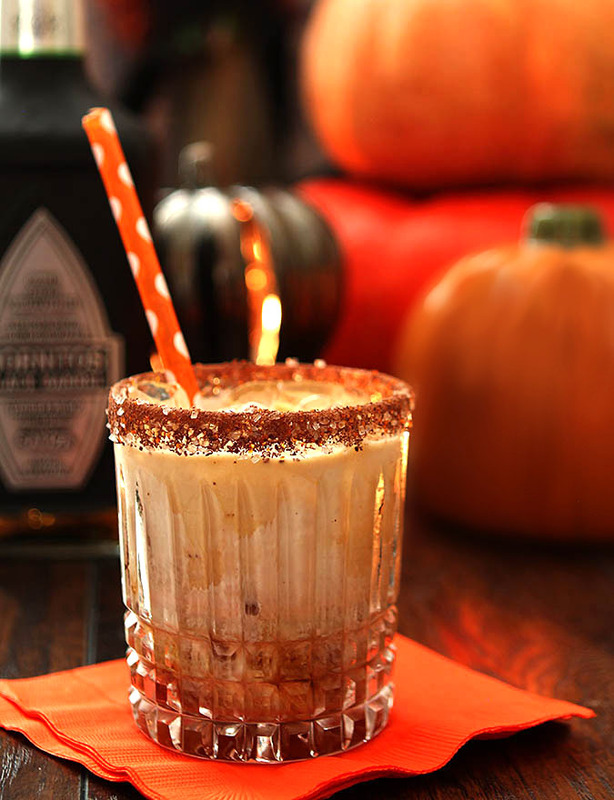 Take a leap of faith and try something new with The Black Goblin Cocktail with Tequila, Kahlua and Cream. Vodka might be a thing of the past this is SO good! I’ll be honest, Halloween is not my favorite holiday. Christmas ranks Number One; with all the color and sparkle and good cheer. Halloween with its dark, scary and more sinister presence has always sort of unnerved me. When my children were small I was the type that made them costumes of felt fashioned to look like strawberries and watermelon and over the years we also had unicorns and Betsy Ross and a long list of handmade outfits but never a witch or a goblin or anything scary. I was sure that my move two years ago would see me finally hang up the Halloween flag and hunker down in a quiet, dark house so I wouldn’t be bothered. And then the kids on this block happened and I adore them all and there is no way in this world that I can’t be present for their big night. And to top it off? I even have a witch costume…how I’ve grown huh? A couple of years ago I was invited to a costume party so I made a black cape and bought a Professor McGonagell witch hat and I’ve sat on the front porch bench and welcomed a bazillion kiddos with that getup. And loved it too. Of course now that I have a place to sit and wait for the kids I admit, I might avail myself of an adult beverage; I’ll even have sippy cups for the parents to have a taste if they want. Wow…I’ve gone from wuss to bad influence haven’t I? I’ve found that I often enjoy cocktails with some extra oomph in them too and I thought in this case that tequila could provide it. Oh. My. So perfect. Not that I haven’t experimented with other warm tequila drinks but I wanted something simple…I seriously will have little tiny cups and a Thermos filled with this elixir waiting for any friend who would like a tipple as they traipse door to door with their kiddos. Just enough for a sip; you know to warm them on the long journey home. Across the street. In preparation for Halloween, I had my neighbor Amy over to share this cocktail with me. Amy was also my model for this event and I was lucky that her day rate was simply the cocktail in the photo. I can do that! Funny, I actually anticipated some hesitation from her at the notion of using tequila in a cocktail with cream and coffee liqueur but she was delighted and LOVED the idea and we both sipped away and had a great time. With our witch hats on no less! Take a leap of faith and trust me on this one…I’m betting that once you try it, vodka will take a backseat and tequila will help this be your new after dinner favorite too! 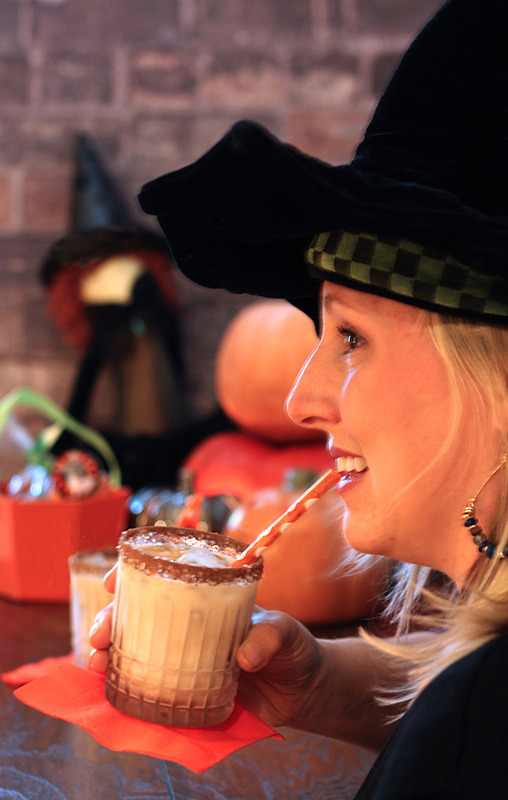 This is a great winter warmer; sure, it’s fun for Halloween but it’s great all season long! .50 oz vanilla syrup (combine 2 Tbsp water, 2 Tbsp vanilla and 2 Tbsp sugar in a small saucepan and heat just until sugar dissolves; remove from heat and cool. Mix the grated chocolate and sugars and put on a plate. Dip the rim of the glasses into some coffee liqueur on another plate and then into the chocolate mixture. Fill the glasses with ice. Combine all cocktail ingredients in a cocktail shaker with ice. Shake vigorously until ice cold and pour into the ice filled glasses. Serve as is or with straws. Cocktails are always best enjoyed with the witch hat on! A white russian was the first cocktail my mom made for me when I was old enough to have a drink with her! This black goblin looks great! I will definitely try this – love the idea of swapping in the tequila! I am totally a Halloween person, although this year I’ve been a bit off my game. I think that it might be because my kids are getting to the scary costume ages. I do have one who wants to be Peter Pan though, so at least there is a bright spot. This cocktail sounds like the perfect thing for mum after everyone has gone to bed on Halloween night. We deserve our tricks and treats too! Halloween doesn’t do much for me, although I always found it loads of fun when I was a kid. Thanksgiving is my favorite holiday — loads of food and drink, and no pressure to send cards, buy gifts, or decorate. Anyway, great looking drink. 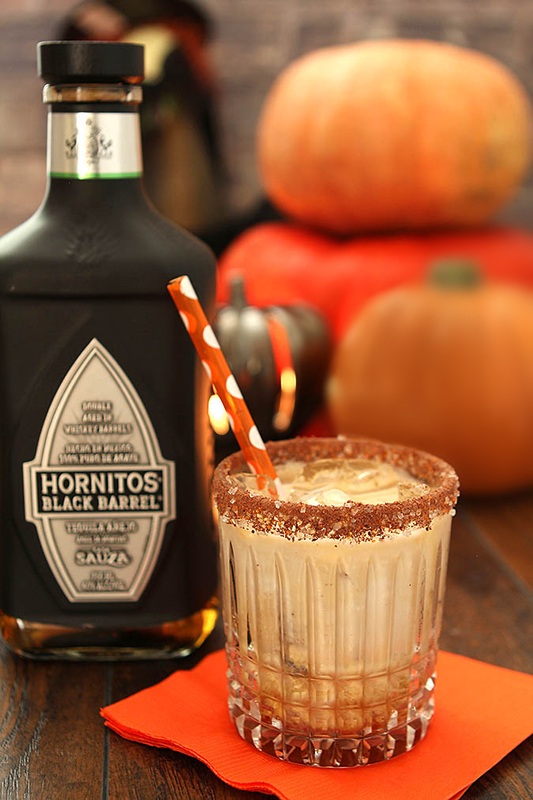 Haven’t tried Hornitos — probably should someday. Thanks!